The GEOTRACES Intermediate Data Product (IDP2017v2) was made available on 14 February 2018. The IDP2017 data product gathers the data acquired during the first 6 years of the programme and builds on the product released in 2014. It expands on the collection of results from the Atlantic and Arctic Oceans and adds new data from the Pacific and Southern Oceans. Version 2 includes additional data not available for version 1 and other amendments as detailed in the IDP2017v2 changes document . the digital datasets — available for download below or as a subset via the online service hosted by the Alfred Wegener Institute (AWI). 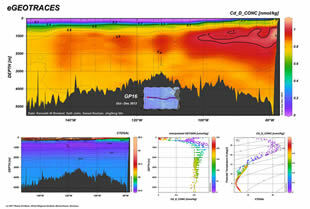 The digital datasets contain hydrographic and biogeochemical data for about 2000 stations from more than 40 cruises and cover the global ocean, with data density being the highest in the Atlantic. 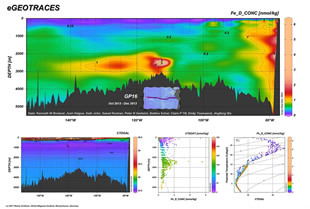 the eGEOTRACES Electronic Atlas — is based on the digital data package and provides section plots (as illustrated below) and animated 3D scenes for many of the parameters. 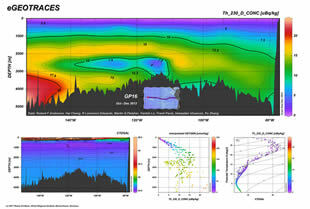 The 3D scenes provide geographical context, which is crucial for correctly assessing extent and origin of tracer plumes as well as for inferring processes acting on the tracers and shaping their distribution. © 2017 Reiner Schlitzer, Alfred Wegener Institute (AWI), Bremerhaven, Germany. Please see IDP2017 version 2 known issues for further information on bad data points which have recently been acknowledged. More information is provided on the IDP2017 brochure. Please help us to improve the Intermediate Data Product by sending us your feedback.